When it comes to using gamification to persuade young people to take greater responsibility for their actions, few ideas have had the planet-saving ambitions of an extraordinary app that encourages users to manage their own carbon footprints. Better than that, the Own Your CO2 app, actually seems to work. Analysis of a seven-day period, coinciding with the recent Earth Day, showed that 557 users of Own Your CO2, logged 21,231 sustainable activities during that week, meaning 23,700 kg (52,140 lbs) of CO2 was deterred - the equivalent emissions of driving over 91,000 km. Their sustainable activities also meant that 1,300 kg (2,860 lbs) of waste was diverted which amounts to 191 bags of garbage. They saved 163,400 litres (43,166 gallons) of water, enough to fill 864 bathtubs. The 106,148 kWh of energy they saved is enough to light a football stadium for eight games. The Own Your CO2 project was spawned at the One Young World 2015 Bangkok Summit, when it was designed by nine Ambassadors from Siemens, the global engineering and technology services company. The nine, who are based in various countries and had never previously met, were inspired by debates at the summit, including discussions around the Paris climate agreement. When the Ambassadors returned to work they stayed in contact and determined to take action. Their vision was to complement Siemens’ goal of becoming the first major, global industrial company to go carbon neutral by fostering ownership of one’s own environmental footprint. Siemens aims to be the first major global industrial company to make all of its global manufacturing and office facilities completely carbon neutral. Own Your Own CO2 was created in partnership with JouleBug, an app that combines social media, gamification, and mobile experiences. Users are encouraged to “buzz” an alert each time they perform a sustainable action which will reduce the size of their carbon footprint, from using a reusable coffee mug to recycling a sheet of paper. The first trial challenge of Own Your Own CO2 in November of last year was based on only a small sample of 45 Siemens employees but together they deterred 2,700 kg of CO2, saved nearly 26,000 liters of water, and enough electricity to power a football stadium for an entire game. 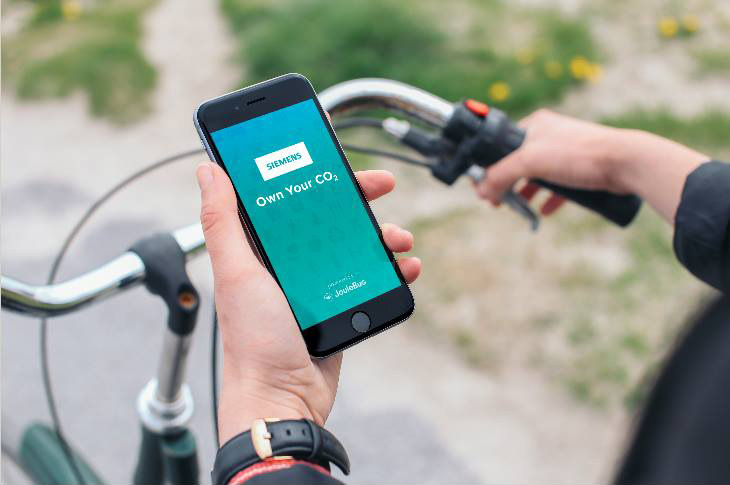 Own Your Own CO2 was initially conceived as a scheme for Siemens and its 400,000 employees worldwide but the evidence of its potential value to the wider public is growing stronger.